The security cameras at the Tesoro Gas Station at 1529 Dillingham Blvd. recorded the men stealing cartons of cigarettes on Oct. 23. 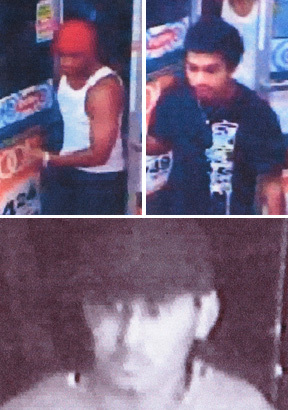 Police are asking the public’s help in finding three men who robbed three Kalihi gas stations last month. The latest robbery took place on Oct. 23 at 2 p.m. at the Tesoro Gas Station at 1529 Dillingham Blvd. Police said the three suspect walked into the store holding white trash bags, went directly to the cashier’s area and began removing cartons of cigarettes. One of the Tesoro workers tried to grab the bag and was scared off by one of the suspects, according to police. A cashier yelled to another worker to lock the front door but the suspects allegedly pushed the workers out of their way and fled. Police said that witnesses who were outside the store tried to detain the suspects but were also assaulted. The same suspects are believed to have robbed the 7-11 at 1950 Kalihi St. on Oct. 5 and the Fast Stop at 2011 North School St. on Oct. 7. In both those robberies the suspect also carried white trash bags and stole cartons of cigarettes. “It’s very unusual,” said CrimeStoppers Coordinator Detective Kim Capplonch. So far the suspects have gotten away with more than $2,000 worth of cigarettes. No weapons were seen during each of the three robberies, police said. All three suspects were recorded by surveillance camera video. Suspect one is described as about 5 foot 8 inches tall, 160 pounds, with a dark complexion. He was last seen wearing a white tank top, dark pants, and red cap. Suspect two is described as 5 foot 5 inches tall, with a medium build, and brown hair and brown eyes. Suspect three is described as 5 foot 8 inches tall, 140 pounds, with black curly hair, brown eyes, and was last seen wearing a red football jersey with white numbers. All three men were said to be in their 20s. Anyone with information about their whereabouts or the robberies is asked to call CrimeStoppers at 955-8300 or by dialing *CRIME on a cellular phone.